News broke out online on Monday that Kano state governor Abdullahi Umar Ganduje donated N10million to the Economic and Financial Crimes Commission (EFCC), Independent Corrupt Practices and other Related Crimes (ICPC) and Athletic Federation of Nigeria (AFN) who organized the first National Anti-Corruption Marathon, in honour of President Muhammadu Buhari. 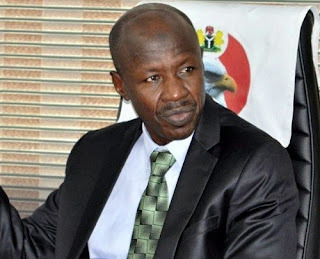 In a swift response to the news, the Economic and Financial Crimes Commission (EFCC) who were trailed with mixed reactions and criticisms from Nigerians online, saying that "the story was not only falsehood but a deliberate attempt to hide the efforts of the Commission in the fight against corruption. It is true that the Commission, in collaboration with the Independent Corrupt Practices and other Related Crimes, ICPC and the Athletic Federation of Nigeria, AFN and other stakeholders is organizing the first National Anti-Corruption Marathon. Mr Jacob Onu, the leader of the National Anti-Corruption Marathon had in the course of his visit to the Commission a fortnight ago told the Acting Chairman and his management about the marathon which he said is being planned in tandem with the International Anti-Corruption Day which usually comes up on December 9 every year. He said it was aimed at raising national consciousness on the danger of corruption to the country and the need for all to join hands and eradicate it. It is therefore very shocking to read of a reported donation of N10 million to the Commission. The story is not only a lie but very unbelievable. For the avoidance of doubt, no State governor or some other individual or group has donated any amount of money to the EFCC to carry out the Anti-corruption Marathon project or any other project.